Today a nagging thought came up that has persisted in my head for the last several years. I was looking at Kokoschka paintings for art class and got a sudden vision of this old children’s book my parents used to read me when I was a kid. I just remember how dark and beautiful I thought this book was even as kid. I remembered the pictures vividly. Leprechuans dripping in paint of all different colors, huddled around, another scene of the creatures stretching something in the sky. Years ago I asked my parents if they remembered what it was, but they had no idea what I was talking about, so I thought I might have made it up. It’s hard to google just from the pictures in your head. I tried for several years with no yeild. Tonight, I resolved to find out what the book was. I searched for “leprechauns rainbow” and “paint leprechauns children’s book” and several variations of this. 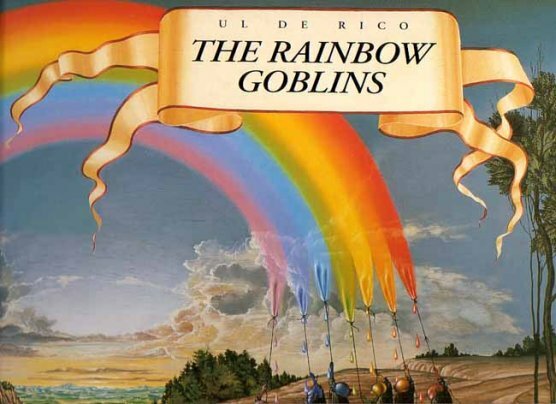 Finally, somewhere in the results I saw the phrase “The Rainbow Goblins” and I knew I had found it! It was so good to see the pictures again, I felt at peace. At the same time I was dissapointed that it was all over. It was this wonderful hazy mystery to me. To find it, and to find it so easily today was odd. I was supposed to find it again in my attic or at some flea market in Belgium. Or never find it and always wonder if it was all in my head. The internet has changed things like that. Stuff like this isn’t a mystery anymore, people aren’t a mystery anymore, you can find out pretty much anything about anyone. You can never wonder what someone is doing ‘right now’ anymore because they are twittering it all over the place. Everything is so connected and for some reason, this makes me feel safe, but with that comes a huge loss in some quality I can’t really describe. So glad other people had the same experience! The imagery really does stick in your mind, my parents recently got it again for me even though I’m 21 now (-: Definitely get it for your kids! Reading about someone else’s experience with The Rainbow Goblins really makes me happy. It was one of my absolute favorite books as a child. The pictures are so vivid and there’s so much going on… I used to giggle about the goblin butts on the page where they drown in the rainbow. I always knew that I wanted my own children to read the same books I did, so I had the forethought to save all of them – including The Rainbow Goblins. I’m 28 now and can’t wait to start a family and show this book to them! My dad gave me the book in 1978 (i was 3 years old). I still have it. The images in that book have been imbedded in my mind my entire life. Dead-on observation about the internet. It’s a brave new world for a child of the 2000s. I have been looking for this book for over 20 years. I had it as a child and it had affected me so much that it imprinted on my mind. The colors, they stayed with me all these years, and I feared the book lost to me. On a whim I did a google search and found your blog. I’ve tried google a few times in the past couple years, I do not know why I was not successful then. I agree with you that its a bit sad that the mystery is no more, but I am glad I can now share this book with my children. I hope it makes as much an impression on them as it did on me. Reblogged this on C. M. Kilmer's Blog.